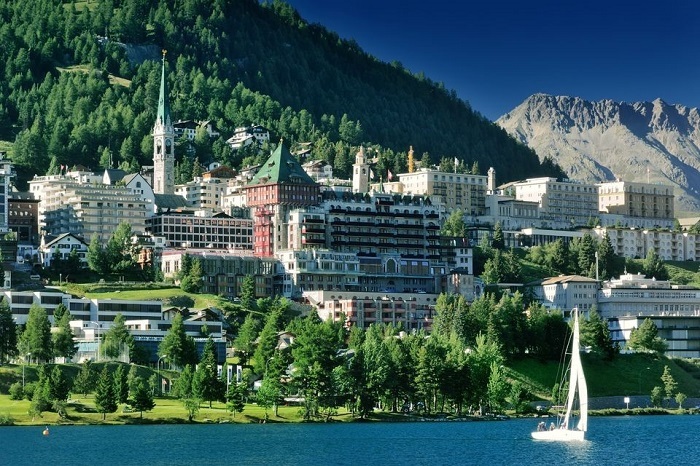 Situated in the heart of Switzerland`s Engadin valley, St. Moritz is one of the most beautiful world`s resort. It was a host of the Winter Olympic Games ones in 1928 and second time in 1948. It is also well known for polo tournaments that were played on the frozen lake of St. Moritz. St. Moritz has 300 days of sunshine per a year, so in the summer it is a training base for lots od athletics, particularly cyclists, runners and race walkers. This stunning place dispose of main sightseeing that you can enjoy in. Enchanting glaciers that you must see, especially the one from Diavolezza to the Morteratsch Glacier and the Piz Corvatsch with its icy cave are the world`s heritage places in Engadine. The Segantini Museum, that is dedicated to Giovanni Segantini, a famous painter is a main attraction of the city.. This alpine holiday destination owns its own airport, named by the Engadine valley and have even two rails, the well-known Bernina Express and the Glacier Express that offers you the stunning view of the Alpine landscapes. Once you are in St. Moritz be a host to the luxury candy shop where you can taste the best Swiss chocolates. One- day tour that brings you the whole inner peace of the world. 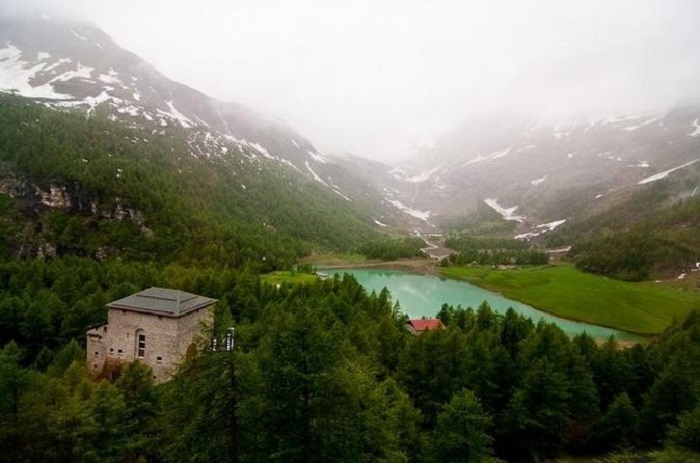 You will enjoy the breathtaking view of the Alps, ride with the comfortable Bernina Express train and pass through the charming scenery of the Engading valley. It is an exciting tour that gives you the opportunity to feel two marvelous towns in one day, the mountainous St. Moritz and historical Tirano. This rail trip begins from the small lovely town Tirano in Italy and takes you up to 1892 meters. You will enjoy those astonishing view of the alpine valley called Engadin. This is a tour that gives you a gorgeous view of the glaciers and explores the world best resort, the alpine town, St. Moritz . Experience a full day journey through the beautiful landscapes of Alps. Enjoy the world famous red train that climbs you up to the highest glaciers and gives you an opportunity to shot some enchanting photos of the pure nature. Stop in the quiet town of Tirano and see the historical monuments. Major tourist attractions here are the Basilica of Madonna di Tirano, the Museo Etnografico Tiranese, and the museum of Palazzo Salis. Visit the luxury resort of St. Moritz and take a walk around to explore the boutiques and candy shops. This wonderful trip starts on the peaceful water of Lake Como where you can explore the dazzling nature around the lake. You will board on the Bernina express train that takes you through the amazing valleys and glaciers up to the adorable St. Moritz. Chiavenna and Bregaglia are the most amazing scenery in the valleys. You will also see the excitable pass of Maloja on your trip to the Alpine mountains. You can enjoy the visit to fashion stores, gift shops or candy shops in St. Moritz or you can have lunch in some of the tasty restaurants. In the end of the trip you will take a railway to the wonderful border city Tirano. Delightful sight of Swiss Alps make this journey one of the most scenic and gives you a full joy of the majestic mountain. Bernina Express train departure from the small town of Tirano where you will have time to explore a charming city. 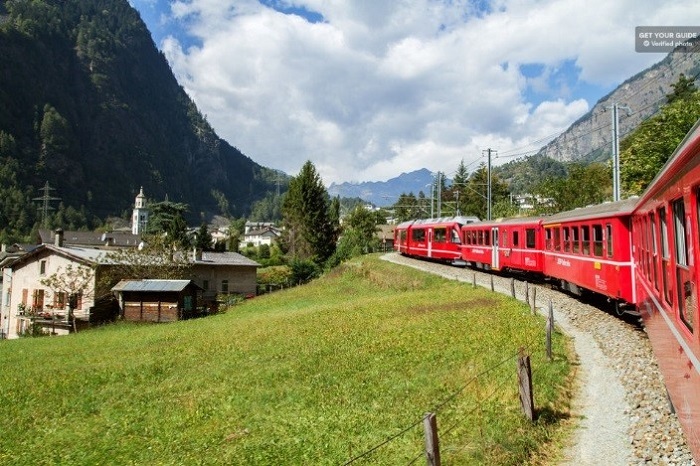 The ride on Bernina red train will make you enjoy in impressive lakes, valleys, waterfalls and glaciers. You will pass through the majestic parts of Italy and the Swiss mountains. When you arrive in the luxury resort of St. Moritz you can discover the elegance of a town and enjoy amount of attractive streets and shops. A collection of precious emotions, remarkable sights, and calm nature. You can take a trip to Lake Como, enjoy the stay in historical and brightness Lugano, but you will feel complete only when you sense the hilarity of the grandiose Alpine scenery. It`s a real pleasure to take this day tour from Milan, as you can explore the importance of this graceful towns. The tour starts on the cristal waters of Lake Como and takes your breath because it`s surrounded with the exclusive villas of the celebrities. 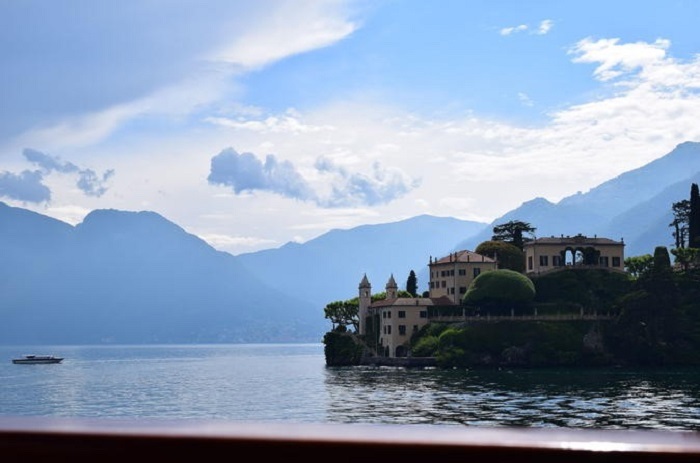 You will also have a chance to spend time in the pearl of the Lake como, the wonderful town of Bellagio where you can have a lunch on your own. Countinue your trip to the Swiss town Lugano and take a walk through the shore to explore the precious view of the lake. You will also have time to go for shopping in the luxury shopes. This is the smallest lake in the Engadin valley where you can enjoy the glorious landscapes of the Alps. You can take a canoe trip and capture some amazing photos from the surrounding mountain nature. In the winter months, polo is the most popular sport played on the frozen lake. It`s a time when the townsman uses a lighter red ball to be easily visible on the snow. This is also a location where you can enjoy in horse races also held on the ice lake and the place where first is invented the sport named skijoring, that means ski- driving. 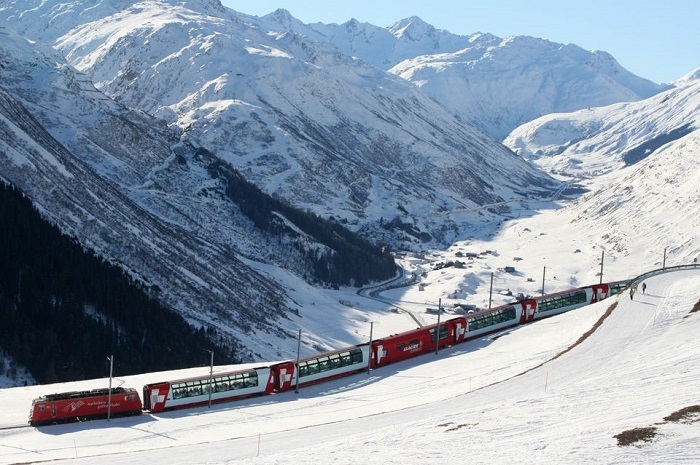 The main connection between Italian Tirano and Swiss St. Moritz is the red express train also known as Bernina Express. The train is used for the purpose of sightseeing and offers the best professional multilingual guides. The winter trip gives you a plentiful view of Piz Bernina, the highest pinpoint of the Eastern Alps. In the spring you can enjoy the lavish nature views and astonishing beauty of the mountain. A museum in honor of the realistic symbolism artist, Giovanni Segantini is placed in St. Moritz. The design of this construction was drawn by Segantini himself and is home for more than a 50 of his works that has painted through his career. His extensive collection introduces the great Alpine scenery seen by his own eyes. Diavolezza is a glittering construction that will take you to the amazing points of the mountain. It is a combination of train and gondola and a first step to climb for lots of people. The professional guide can take you to hike over the Pers and Morteratsch Glaciers where you can feel the frozen beauty of both. This museum building looks like it is 300 hundred years old, but the Engadine style house is only one hundred years old. The construction takes place in the world history heritage and includes artifacts from Neolithic and Bronze Ages and Roman finds from the region. The 4000 items in the house illustrate the local life from the 13-th to 19-th century. Lake Staz is a small but very attractive lake for the swimmer lovers. The lake water warms up faster in the summer months so most of the people use it for relaxing and do a daily excursion on the the waterside. For the one who wants a freshly cooked food, there is also a plenty of restaurants where they can take a breath and enjoy the glow of the water lake. Back in the 19-th century, St. Moritz was the main artery of the winter sports and Alpine tourism. During the winter months, the famous bob run is the legend of all sports. The game was created in 1904 for the British tourists and first time appears in 1928 and 1948 on the Winter Olimpic games. The summer months are extremely popular for those who enjoy running, cycling or race walking. The Engadine valley has plenty of trails for the bike lovers. The most attractive trail is Corviglia flow trail that is even suitable for children aged 12 and families. The bike tour will take you to the enchanting sightseeings and nice fitted paths. St. Moritz ensure more than 350 kilometers of pistes connected by ski lifts and gondolas. The best-known areas for the skiers are Corviglia, Corvatsch, Diavolezza, and Zuoz where you can find the good snow covers for the skiing necessities. For the freestylers and seasoned skiers, Corviglia is great point to express your skills. St.Moritz is the right place for the gourmets because they can always taste something new and delicious. The Engadine walnut tart is a perfect solution for the ones that enjoy a combination of caramel, cream and generous heaps of walnuts. The drink lovers can always enjoy in a miscellaneous choice of whiskey. The Hotel am Waldsee has the most popular whiskey bar called Devi`s Place that owns over 2500 varieties of whiskey, that according to the Guinness book of records is the most extensive whiskey bar in the world.